Recently we installed a Spinning Bike and a desk in our bedroom. If you ever sat on a spinning bike you might have noticed how boring this can be. It would be great to have a TV in front of the bike to distract. On the desk however I’d like to have a decent monitor to be able to work from home comfortably. 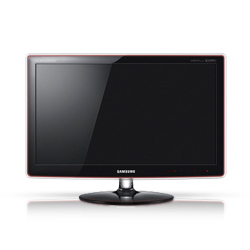 The Samsung P2470HD monitor / TV was the solution for both requirements. One screen is able to show TV straight from the Cable signal and is able to display PC output from either VGA or HDMI. The 24″ screen size is big enough to watch TV from the bike. The speaker volume is loud enough to overrule the noise spinning bike. The HD resolution is even ready for watching an occasional movie in HD. The installation was very easy. I never needed the manual. I managed to install the different TV channels without it. Might you experience any issues then you can find the English user manual below in PDF. Does by any chance your hd tv/monitor produces an operation noise when you use Standard Picture Mode or Custom Magic Bright adjustments? That is, produces background operation noise when your definitions are higher on contrast and brightness? This happens using either HDMI or VGA interface. Inderdaad een geweldige TV/monitor combi. Als TV prima voor in de (kleine) woonkamer, en als monitor echt een superscherm.